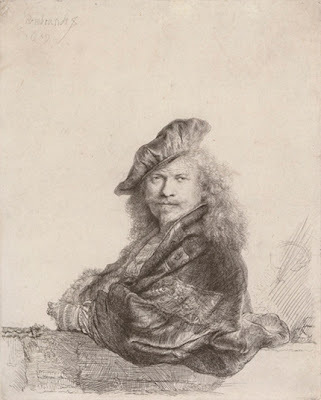 Rembrandt and His School, The Frick Collection (through May 15th). There’s so much going on in New York now that it’s actually possible to miss this — a show that would be a blockbuster anywhere else. Don’t miss it. I was lucky enough to see a similar exhibition at the Getty Museum last summer called Rembrandt and his Pupils (it ended Feb 28th). That exhibition was more didactic than this. It had lots of educational videos and slides and explanatory labels that compared drawings done by Rembrandt with drawings of the same subject done by his pupils. I wrote about here. The Frick's show is more straightforward: 30 works on paper by Rembrandt, and 36 more by his most prominent pupils including Ferdinand Bol, Jan Lievens, Nicolaes Maes, and some rare drawings by Carel Fabritius. Most delightful were several self-portraits in melodramatic poses that Rembrandt must have had a lot of fun doing. The show works well in the Frick's relatively low and small basement space because it adds to the intimacy of the experience. Cezanne’s Card Players, The Metropolitan Museum of Art (through May 8th). We blogged about this show already here and here, but I want to make one more general point about how I perceive Cezanne’s paintings and watercolors. Maybe it's just me, but I've never experienced Cezanne's paintings as massive, rounded, solid forms. Instead I perceive them as elusive, evanescent, unstable forms of glowing color so gaseous I feel I can put my finger into them. Take Seated Peasant, c. 1892-96, for example. The grays of his pants and jacket, while boldly drawn, appear to be swelling with glowing gray light, and the reflections on his face and hands seem to shimmer and flicker. Things shift in space (to me anyway). His eyes blink, his mustache and mouth shift, his chest expands as if he’s breathing. 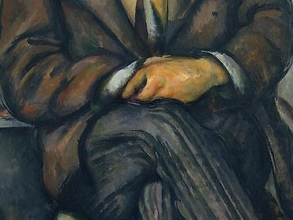 Paul Cézanne, Seated Peasant, ca. 1892–96, Oil on canvas; 21 1/2 x 17 3/4 in. (The Metropolitan Museum of Art). The mind seeks symmetry and balance, and when it’s not there we put it there -- even if it means making things appear to move or glow or change color. 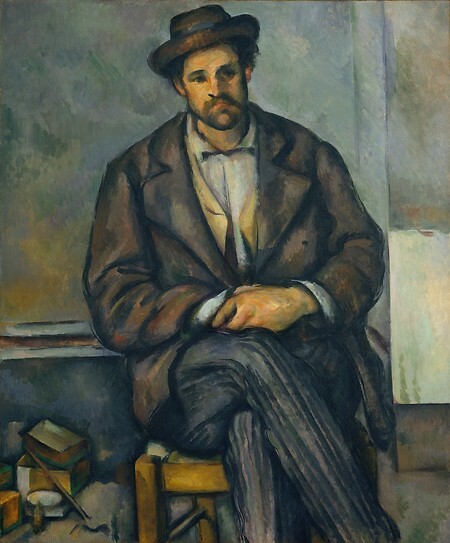 With Cezanne, some changes are from simultaneous color effects; others are the result of tensions described by Erle Loran as early as the 1920’s. And there’s a lot of movement because everything is both set in space and pushed forward — the figure of course, especially his hands, but also the book and box on the lower left; the chair is tilted up as is his hat; even the wall in the background attaches itself to his hair and clothes. Forms in space are flattened because they’re placed side by side and fitted together like a puzzle; likewise, even the brushwork is frontal, and strokes are placed side by side like a mosaic. Unlike other neighborhoods where there are a lot of art galleries, there isn't much else besides galleries in Chelsea, so if the art stinks it can be a long, depressing day. Unfortunately, this month there aren't many shows in Chelsea I'd recommend. There are some though. 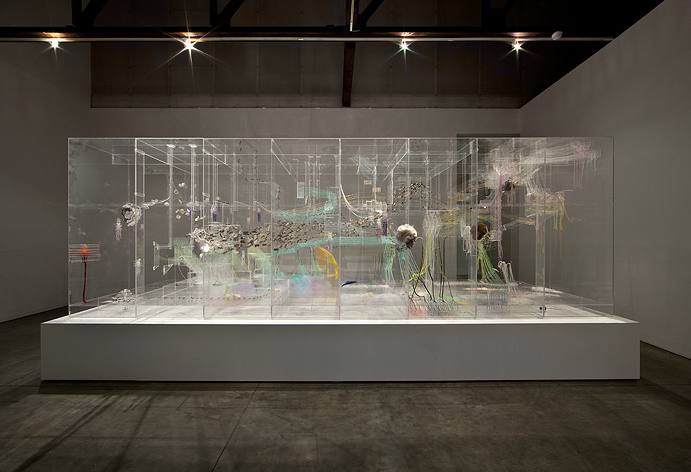 David Altmejd at Andrea Rosen (through April 23rd). This is NOT a show I liked, but it’s getting so much favorable attention I feel it’s important to state my objections. Basically, I believe, she takes no chances but goes directly for empty beauty. I feel about her work the same way I feel about the revered ( not by me, obviously) Robert Smithson — the work is just humble materials made into very large decorations. Ellsworth Kelly at Matthew Marks (through April 16th). I was frankly getting bored with Kelly, who seems to have been making the same basic painting for 40 years or so, at least the same basic idea. And that hasn’t changed in this show. But the new work the 87-year old Kelly has shown here is so refined, so simple and elegant, that it completely won me over. Maybe part of the reason is all the work is black and white. Kelly never really used color as color anyway, but like Stella (and Picasso for that matter) he used color mainly to distinguish one shape from another. I’m exaggerating, but their colors rarely breathe, resonate or glow like Matisse or Morris Lewis for example. Kelly, like the others, is mostly interested in drawing, and nothing is more clear than black and white when it comes to drawing. Gary Hill at Barbara Gladstone (through April 23rd). ...Hill has continuously offered multilayered investigations into the phenomenological nature of how we perceive the world through a network of visual, aural and linguistic signals. Exploring the cognitive and sensorial conditions that underlie our discursive modes of communication, Hill experiments with the material and sonic properties of language to offer provocative meditations upon the production of meaning within our everyday contexts. Since the early 1970s, Hill’s use of video has occupied a central role in his artistic practice, using the medium as a formal site and structure to both examine and deconstruct the power of the image. Concerned with an increasingly homogenized visual culture, Hill disarticulates the primary communicative function of electronic media by playing with sound, speed, and sequence, to produce not only radical ruptures within our normative processes of perception, but also new ways of encountering meaning. BTW, Hill has one of the best artist websites I’ve ever seen. It really helps you get a feeling for his work. In addition to art galleries, I also attended a couple of talks. One was John Elderfield on de Kooning at The New York Studio School this past Wednesday, March 30th. Elderfield is one of my favorite art historians and curators. He’s working on a major de Kooning retrospective scheduled for 2011 at The Museum of Modern Art. I feel vindicated that Elderfield likes de Kooning's late work from the 1980’s. I've always felt that period was his strongest, but people would say he was drunk and gaga when he did them, if he did them at all. Some claim his assistants really did them. 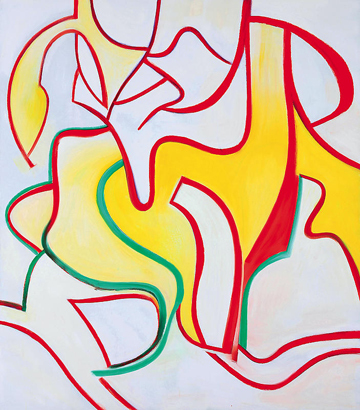 Elderfield says de Kooning got no more assistance than other artists and that essentially he did the work; and even if he suffered from dementia during this phase, all it means is he was able to focus more intently on the thing he knew best -- painting. An examination of these paintings should be proof enough. The way a line becomes a ribbon, becomes a shape, becomes a field, becomes a contour, all the while twisting in space and changing colors, is painterly brilliance. Simple, elegant, efficient — a great example of an artist's late phase. “Split of Light: Experimental Media,” a panel discussion at Electronic Arts Intermix (EAI) about creating, distributing and presenting experimental film and video. Panels are usually boring because the panelists tend to wander all over the place, but this one was efficiently moderated by Rebecca Cleman, EAI's Director of Distribution, who got them to stick to the topics. One thing I was particularly interested in was a discussion of the difference between experiencing a film or video in a theater vs. a gallery. I had just seen the documentary “Bill Cunningham” at Film Forum (great film, BTW) and was thinking how different seeing it on Netflix would have been. There’s something about watching a movie with other people that makes it funnier, more dramatic, more moving, sadder, etc. From the Times's ArtsBeat Blog: As part of the Festival of Ideas for The New City, a series of arts and civic events that the New Museum and several other downtown cultural institutions will conduct from May 4 through May 8, well-known artists have been recruited to create paintings that will soon start appearing on roll-down gates along the Bowery, from Houston Street to Canal Street. 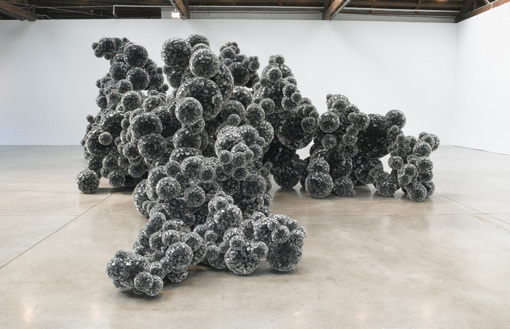 And it took the Wall Street Journal to get access to Larry Gagosian for this revealing article. I did see the Noland show and there were some great color paintings, but some bizarre ones too. It was nice to see him explore different things. I just came back from a couple of days in Washington (I'll be posting on that in a few days) where I saw a large Blinky Palermo. Same story with him -- he doesn't really use color any more than Kelly -- and his drawing isn't that interesting. I saw a lot of art that made the trip worthwhile, though. Mainly oldies but goodies like Leonardo's Ginevra Benci.